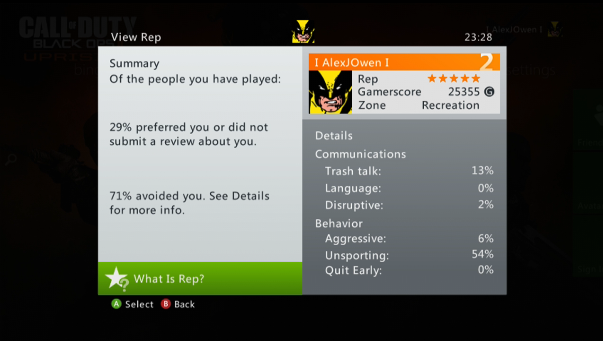 It has been reported that the Xbox One will use a new and improved reputation system. It seems Microsoft will be gunning for the “trolls” with this system, Lavin added, "Ultimately if there's a few per cent of our population that are causing the rest of the population to have a miserable time, we should be able to identify those folks." Exploitation of the system won’t be an issue either, Lavin revealed that they system cannot be influenced by those who dislike you, "Let's just be clear, there is no way at all that a conglomerate of people can conspire to sink your Reputation on the system. The way that it's built fundamentally stops that. It's very much over a period of time - if we see consistently that people, for instance, don't like playing with you, that you're consistently blocked, that you're the subject of enforcement actions because you're sending n***d pictures of yourself to people that don't want n***d pictures of you... Blatant things like that have the ability to quickly reduce your Reputation score." So Microsoft are rounding up the griefers, the trolls and the vulgar and placing them in one bracket and the friendly ones in another. The new reputation system may prove useless but only time will tell, it is a time consuming process to filter out the trolls from your online experiences. Will it work or will it fail? What do you think about this system? Please leave your comments below.